WELCOME TO THE WONDERFUL WORLD OF PERMANENT MAKEUP & MICROBLADING! A world that is filled with an effortless way of looking pretty and enhancing your every feature. We have designed this site to be the definitive resource for those who want to know more about the benefits and issues surrounding Permanent Makeup. Our goal is to help you make a more informed decision about the investment you are about to make in your natural beauty. Permanent makeup is used to enhance, correct facial features and emphasize your own natural beauty by permanently implanting colored pigments within the skin. The pigments are mixed individually for each client skin tone. Permanent Makeup, also known as Micropigmentation or Permanent Cosmetics is a non-surgical procedure. The process includes an initial consultation, procedure and a follow-up visit for adjusting the shape, color or density of the pigment. Color choices and shaping are determined during a free consultation, which you can schedule in our permanent makeup NJ offices. Permanent Makeup allows you to look your best at all times! Each treatment is as unique as the individual receiving it. Permanent cosmetics allows busy people to look their best, enhances their beauty, giving them what mother nature didn't. At the same time helping their self-esteem. You can camouflage scars from accidents, burns, and surgeries. To restore the natural skin color. Permanent cosmetics is a state of the art form of cosmetic tattooing. Color is implanted into the dermal layer of skin with a specially designed instrument. 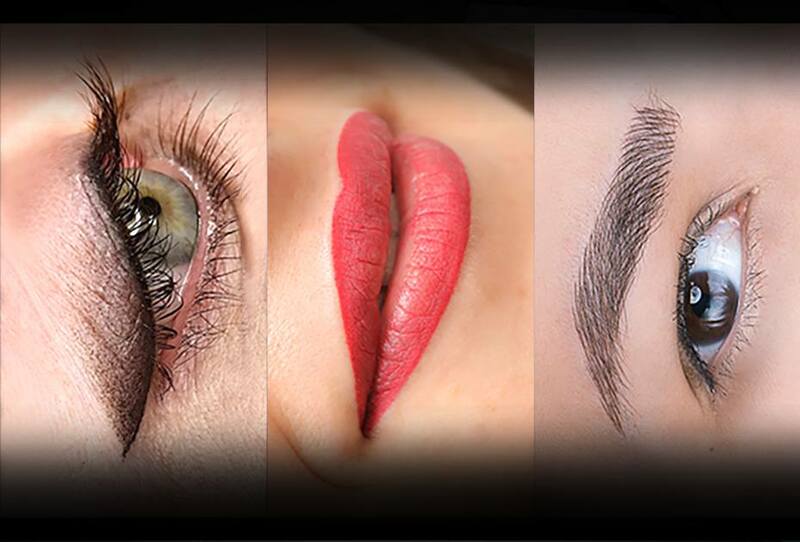 Our permanent makeup fees range from $250.00 - $450.00 for Original work. Click here for our price list. Some technicians charge much more, although higher prices don't necessarily mean you will get better quality work. It's important to carefully check the credentials of your technician! Our clients feel that the cost to have their Permanent Makeup applied is very reasonable. The freedom they experience from not having to worry if their makeup has worn off or smeared makes it easy to enjoy life with confidence because they know they look good 24 hours a day, everyday! We use Anestop as a topical anesthetic and it is very effective. It's been our experience that many people fall asleep during the procedure. There is usually some minor discomfort, although everyone's tolerance level is different. Most people describe the sensation to be much less than they expected and are pleased with their new Permanent Makeup. Absolutely! At our office, the client's safety is our highest concern and we use SofTap® Disposable Pens. The "Comfort System” needles are 100% disposable pens for a safe and easy application of pigment for all permanent makeup procedures. The fine tip needles are in-line and slanted to apply pigment quickly and comfortably. Do I have a choice in the color? Yes. Your input is necessary to achieve the results you will be satisfied with. Plan on bringing your favorite lip/eye/brow makeup with you. We take into consideration the colors you prefer as well as your natural skin color, hair color and eye color. A soft, natural look is always preferred, but a more made up look can also be achieved. How do I know that you will do what I want? It is our goal to work with you to achieve the look you want. Our approach is one of "teamwork." We begin the procedure by taking a "before" picture without your makeup. Then we begin the "design" phase. We will ask you to draw on what you normally do. Then, we will help you fine-tune the design by making suggestions, adding and subtracting from the design, and asking for your feedback. We will work together until the design looks even and balanced and we are both pleased with the result. During the procedure, we will follow the design lines that have already been created with pencil. Yes, Permanent make-up looks more natural than eyebrow pencils. A soft fill-in of color will create the appearance of a soft, full brow. We also use hair strokes technique to make eyebrows look more natural. The color will soften and fade over time due to many factors such as skin exfoliation (both natural and chemically induced), sun exposure and/or tanning beds, and some types of medication. Sun exposure is the major reason pigment fades. You may want to refresh your color in approximately 2-5 years. The cost for a Retouch is about half the cost of the initial application. Can a permanent makeup be done in only one session? Sometimes. But mostly, Permanent Cosmetics is a multi-session process. We begin with a consultation and the first application. We arrange for a follow-up visit in 30-60 days, to check for light spots re-define any areas that require it. A lot will depend on your skin's own healing process as to what work needs to be done during the follow-up visit. There is no extra charge for the follow-up visit at our office. How much time does the permanent makeup procedure take? Each procedure takes approximately between 1 to 3 hours to complete. This includes time that is taken for Consultation of design and color prior to procedure, anesthetic time, application time, after care instruction, any bathroom breaks and scheduling a follow up visit. Because of the high degree of attention and focus required by each technician during the procedure, we do not allow children in the treatment room. We do not allow children to be left in the lobby. Can I wear regular make-up after the permanent makeup is done? We prefer you wear NO traditional make up on the procedure site as it needs to heal for about 7 days. However, you may wear makeup everywhere else. For Eyebrows, you could have the procedure performed in the morning and be at work the same afternoon. For Eyeliner, you may return to work the next day. Your eyes may look slightly "puffy" for 1-2 days, as if you've been crying. Lips usually require 2 days off to allow the swelling to go down. Are there precautions that should be taken before permanent makeup is done? DO NOT TAKE: Aspirin, Fish Oil, Niacin, Vitamin E and/or Ibuprofen unless medically necessary, 72 hrs prior to your procedure. Tylenol is fine. For EYELINER: If you wear contact lenses, bring your glasses with you and plan on using your glasses for at least the next 4 days. For LIPLINER or FULL LIP COLOR: If you have ever had a cold sore or fever blisters in your life, we suggest that you obtain a 10-day oral prescription for Zovirax, Aclovir, Valtrex or Famvir capsules (an antiviral medication) from your physician or dentist and begin taking them 5 days prior to this procedure and continue taking them 5 days after. Once the procedure has taken place it is also necessary to shield the lips from the sun for 5-7 days to prevent blisters from occurring. Can I wear additional makeup over my permanent makeup? Yes. Micropigmentation applications provide a subtle look for natural feature enhancement. You may choose to apply more makeup for more glamorous look. What about allergic reactions to the pigments? Our pigments are inorganic iron oxides which contain no artificial additives and do not contain FD & C or D&C dyes. "Less than .l% in over 100,000 estimated permanent cosmetic procedures performed nationwide over the last 10 years resulted in an allergic reaction," according to Micropigmentation, State of the Art, by Charles S. Zwerling. M.D. Many of our clients cannot wear regular traditional cosmetics due to allergies.... with Permanent Cosmetics, now they can have carefree makeup, 24 hours a day. Since this is a tattoo, will the color turn green or look blotchy with age? No. The pigments used in Permanent Cosmetics are different from traditional tattooing. Our pigments do not migrate or appear "blotchy" over time, because we use inert iron oxides. In addition, the color will fade naturally over time. However, a lot depends on the skill level of the Technician. If you choose to have your Permanent Cosmetics applied elsewhere, be sure to ask if they are using traditional tattoo inks or if they are using iron oxides. Some technicians do use the tattoo inks. In addition, not every technician has been properly trained in color theory. Your technician must understand the role that our skin's natural undertones play in achieving your desired color. Choose your technician wisely!!! Since my Permanent Makeup will eventually fade, why is it called Permanent? Permanent Makeup or Permanent Cosmetic are considered permanent because the color is implanted into the dermal layer of the skin and cannot be washed off. Your Permanent Makeup will require some periodic maintenance (most people have a retouch in 2-5 years). It is important to consider this and all aspects of the procedure when selecting a potential permanent cosmetic makeup technician. Although it is a permanent makeup, these procedures do have some degree of flexibility in changing color and shape to some extent, depending on the expertise of your technician. Your Permanent Makeup will appear darker immediately following the procedure but during the healing period, you will see the color soften and lighten up. It's important to remember that at first, your Permanent Makeup will look TOO DARK. This is because you have not yet gone through the healing process, and the top layer has not yet sloughed off. The healing period for most people is 7 days. During the healing period for all procedures, it is important not to pick, pull, scratch or rub off the top layer (which will appear too dark) in any way. If you do, you will most likely be pulling out some of the implanted color.... resulting in an additional cost to re-apply. You must let this top layer slough off by itself. Complete After Care Instructions will be given to you by your Technician, both orally and in written form.